According to an Independent Communication Network (BİA) report, 315 media employees in Turkey, including reporters, columnists, executives and illustrators, face 47 aggravated life sentences, one life sentence, 3,034 years of imprisonment and TL 4.040.000 ($840,000) in damages. The report stated that in 33 trials in April, May and June, the courts handed down two aggravated life sentences without the chance of parole and 137 years, two months and 19 days in prison to journalists on charges of supporting a failed coup in 2016, disseminating terrorist propaganda, membership in a terrorist organization, defying state institutions or insulting the president. 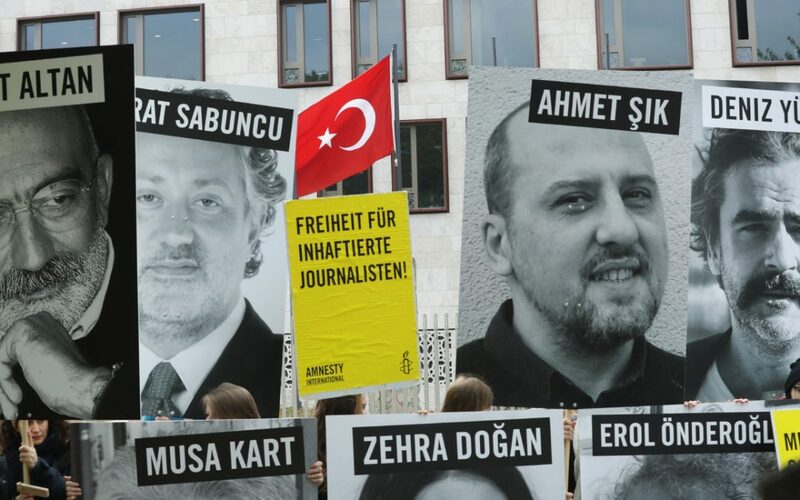 In that same period 22 journalists were accused by prosecutors of insulting President Recep Tayyip Erdoğan, with only two of them acquitted thus far. The report also revealed that 32 news stories, 77 tweets, 22 Facebook posts and five YouTube videos were censored during those three months. Wikipedia, an online encyclopedia, has been blocked in Turkey since April 2017 for publishing an article that claimed Turkey and the Islamic State in Iraq and the Levant (ISIL) had ties. As of July 1, the report says, 127 journalists were behind bars. While 73 of them were working in media outlets affiliated with the Gülen movement, 39 were employees in the Kurdish media. In the three-month period, five more journalists were detained. Turkish authorities accuse the Gülen movement of orchestrating a coup attempt on July 15, 2016, although the movement strongly denies any involvement. Since then more than 200,000 people from the movement have been investigated, according to the Justice Ministry. In that period, two reporters and a media office were physically attacked, and 65 journalists were subjected to verbal assaults, including seven death threats. Nationalist Movement Party (MHP) leader Devlet Bahçeli ran an advertisement in a number of newspapers on June 26, listing the names of 70 journalists from various media outlets, researchers and polling company managers who, according to him, had defamed his party during the recent election campaign. Bahçeli’s close friend, notorious mafia leader Alaattin Çakıcı, also posted a death threat on Instagram aimed at columnists from the Karar daily after it reported on the claim. Turkey’s Radio and Television Supreme Council (RTÜK), a media watchdog, ordered the discontinuation of six TV programs and issued fines totaling more than TL 1 million ($207,000) on 14 occasions. Also in this period, 25 journalists lost their jobs.